The Amirauté Golf is located 5 minutes from Deauville. This wonderful course extends on 100 ha; it comprises ponds, large greens and monumental sculptures made by the most renowned contemporary artists. The architect Bill Baker has created a real championship course accessible to everybody. The Amirauté Golf includes a 9-hole course, lighted at night, 2 putting-greens, a covered driving range with 42 tees, a grass driving range, a pro-shop, a sauna, a restaurant and a reception area. What about playing golf when night falls? 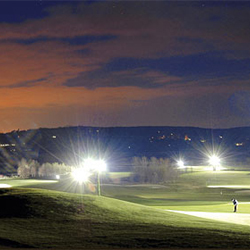 Your dreams may come true in a 9-hole course, enlighten at night, unique in Europe. The Club House of the Amirauté Golf is situated in the large buildings of a Normand stud farm. Its large windows offer a panoramic view on the courses and on the Touques valley. In the club house: Pro Shop, cashmere, clothes and golf equipment shops. Bar, relaxing and friendly area. “Les Chaumes” restaurant, for a lunch or dinner in a warm area.